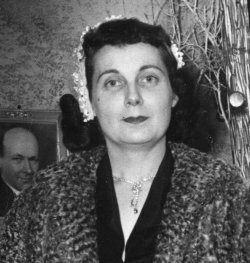 A little creative sleuthing brought me into contact with Gerald Byron's reclusive widow, Françoise. Even though I introduced myself, to my surprise she was less than receptive with my presence. At the beginning, Françoise was extremely protective towards any mention of her late husband's name. After hearing her story, I can understand why. During the first minutes of my reunion with her, I was so focused with this sweet frail 82 year old lady that I failed to notice my surroundings. Suddenly, like a bolt of lightning it hit me - a moment of epiphany. For what seemed like an eternity I was in a twilight zone. About the only way to describe it is as though I was standing inside a slow motion slide show where every inch of every wall framed the most stunning display of art under one roof I had ever seen in my life. While my focus shifted from one masterpiece after another I was struck by a certain feeling of awe. I can truly say that this was one of the rare occasions that one may use the term masterpiece and mean it with conviction. After getting my composure back in order, I turned to her. My comment was, "do you realize you have a part of Canadian history in your home?" She quietly replied, "I know". I emphasized the importance of what she possessed and there was a need to share these treasures with the world. With those words her demeanor immediately changed and she demanded I leave her premises. She made it abundantly clear that she had no intention of parting with her beloved collection. I defensively tried to explain those were not my intentions, but to no avail. The door slammed behind me. At this point I was like a lost child, not knowing which way to turn. Many weeks followed. I decided to try again, this time with the utmost caution. When I approached her house I was petrified, it was almost like facing a firing squad. Then the door swung open and there she stood with just a hint of a wry smile on her face. Her first words were: Ques qu'il t'as pris autant de temps? The translation in English is "What took you so long?" I shrugged and reminded her that my French was not fluent. With this, she invited me into her home. Entering through the front door, I noticed this time around her health had deteriorated rapidly from the last time I saw her. I felt she appreciated my company greatly - as if a prisoner in solitary confinement was sounding out a desolate plea for human contact after so many years of neglect. After conversing with her for many hours, I realized it all came down to not wanting to separate herself from her husband's art. People's past greed and selfishness also brought her to this state of mind. At times she criticized herself for her lack of not coming up with a coherent plan to curb such people. She also lamented that in today's world of multimedia, multi-channel cable television, computers and other entertainment options, that it hurts there has been no public or governmental fuss or outcry about this mediums seemingly slow demise. In the future, would anyone care about Gerald Byron, his art or indeed, about art in general? I could only reply, "in the day to day lives of the common man these matters were of little concern." Spending the evening at her home and the following eight months by her side as her confidant and friend made me realize it was no longer about the art anymore. I realized it was about this magnificent lady who didn't want to die alone.